Ultra Products recently released three new versions of the MicroFly case, the BX6, MX6, and SX6. The new versions of the MicroFly still use the same basic layout and structure with a few modifications to the design. The BX6 and SX6 both have a door covering the drive bays, while the MX6's front panel is covered in mesh. All three case have removed the carrying handle that is on the original MicroFly. 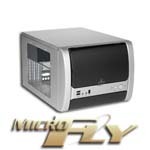 Today we will be taking a look at the MicroFly SX6. Good review Tazz, also it's a good looking unit. Hope to see a review on all the others to see the differences of each one side by side. Happy Modding to ya.